Hunger is not the only reason we eat sweets. Often we eat as a way to celebrate, or sometimes we reach for food when we're sad or bored. And a study published this month in the journal Environment and Behavior points to another factor that can nudge us to eat: clutter. "The notion that places — such as cluttered offices or disorganized homes — can be modified to help us control our food intake is becoming an important solution in helping us become more slim by design," report Brian Wansink of Cornell University and his colleagues in their write-up of the study. "It's important to know whether a food environment can actually cause you to, unknowingly, overeat," Wansink told us. So, in order to examine how clutter and chaos can influence what — and how much — people eat, Wansink and his collaborators designed an experiment. They set up two kitchens. One kitchen was neat and tidy. The other was strewn with mail, newspapers and dirty dishes. "It was a mess,'" Wansink said. Then, they recruited women to participate in the study. "We brought 100 people into [the] kitchens — just one at a time," he explained. The participants were given a writing assignment. Some were told to write about a time they felt out of control. Others were to write about a time when they felt in control. The participants were also given snacks — including cookies, crackers and carrots. (The snacks were the same in both kitchens.) And all were told: "Feel free to eat as much as you want, because we have tons of this food." "We think we're smarter than the environment around us," Wansick said. "That's why these external cues are so powerful." We're often not aware that they're influencing our behavior. 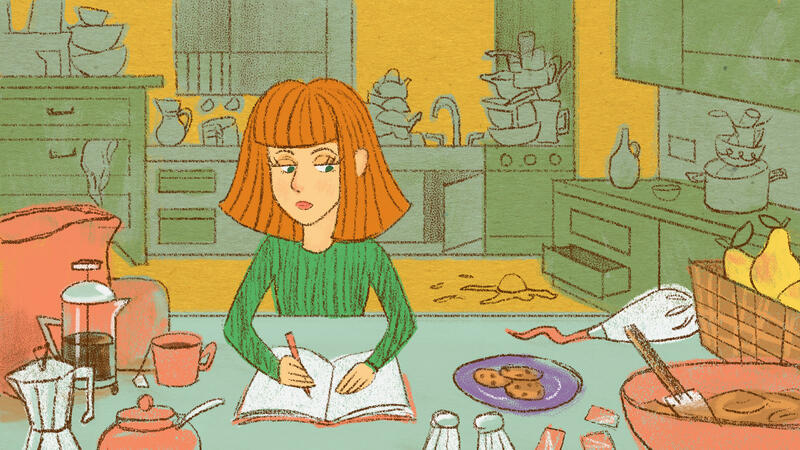 In the cluttered kitchen, the scientists also found that women who wrote about a time when they felt in control consumed fewer calories from cookies (averaging 38 calories) than did the women who wrote about a time when they were out of control. "The results suggest that an individual's mindset can moderate the impact of a chaotic environment on food intake, particularly for sweet foods," the authors write. A chaotic environment didn't significantly impact consumption of the carrots or crackers. So, how might these findings translate to a messy desk? After all, many of us do a lot of snacking at the office. "This study makes a lot of connections to workplace environments," Kathleen Vohs, a psychologist at the University of Minnesota, who has studied how messy desks or rooms can influence behavior, told us. "Messy rooms are, sort of, enabling people to break free from what's expected of them," she said. A few years ago Vohs published the results of an experiment that placed participants either in a messy setting with papers and office supplies scattered throughout, or in a clutter-free room. She found that people in the orderly room were more inclined than those in the messy room to choose a healthy snack — an apple. "The results confirmed the prediction that an orderly environment leads to more desirable, normatively good behaviors," she and her co-authors write in their study published in Psychological Science. The authors of the "cluttered kitchen" research admit that, though it certainly seemed as though writing about an event when they felt out of control made the participants feel more stressed, their study didn't directly measure that. "It will be important for future research to determine the specific emotional or cognitive mechanisms through which these conditions can impact people's food intake," they conclude. You know, Mary Louise, I'm a little envious. I've noticed that your desk in the office over there is really, really clean. Your work space here in the studio is really clean. Are you a clean freak? Like, is this important to you all the time? I'm going to take exception to the freak part of that. But yeah, OK, fine - I am 100 percent guilty as charged. GREENE: Is your kitchen this clean, too? GREENE: ...Because we're about to listen to a piece by our colleague Allison Aubrey, who actually says the cleanliness of your kitchen tells us something about your eating habits. ALLISON AUBREY, BYLINE: When you walked into your kitchen this morning, was it neat and tidy, or did it look like this? BRIAN WANSINK: There's mail stacked on the counter. There are dirty dishes, newspapers that were on the edge of the table. The place was a mess. AUBREY: That's Brian Wansink of Cornell University, describing the kitchen that he used in his latest experiment. Wansink studies how our environments influence our habits. And he had a hunch that a cluttered kitchen might prompt us to overeat, so he decided to test it. WANSINK: We brought 100 people into kitchens just one at a time. AUBREY: And had them hang out with a plate full of cookies and crackers. Now, half the people were brought into that messy kitchen that Wansink just described. The other half came into a very tidy kitchen. They were all told to eat as much as they wanted and given a writing assignment to complete aimed at expressing how they felt. What Wansink found is that when people wrote about feeling out of control and were in a messy kitchen, they ate more - a lot more than those who were stressed but in a neat kitchen. WANSINK: And one of the things we found that if people were in a messy kitchen, they ended up eating about 40 percent more calories of snacks than people in an uncluttered, nonchaotic kitchen. AUBREY: Which suggests that our environments can be a potent force in shaping the way we eat. WANSINK: We all think we are smarter than the environment around us. And that's what makes these external cues so powerful. AUBREY: They're nudging our behaviors in ways we're not even aware of. So how might these findings translate into a messy desk? After all, there's lots of snacking in offices. KATHLEEN VOHS: This study makes a lot of connections to workplace environment. AUBREY: Kathleen Vohs of the University of Minnesota has studied how messy desks can influence our behavior. VOHS: Messy rooms are sort of enabling people to break free from what's expected of them. AUBREY: And that can lead to more unhealthy snacking. Allison Aubrey, NPR News. Transcript provided by NPR, Copyright NPR.